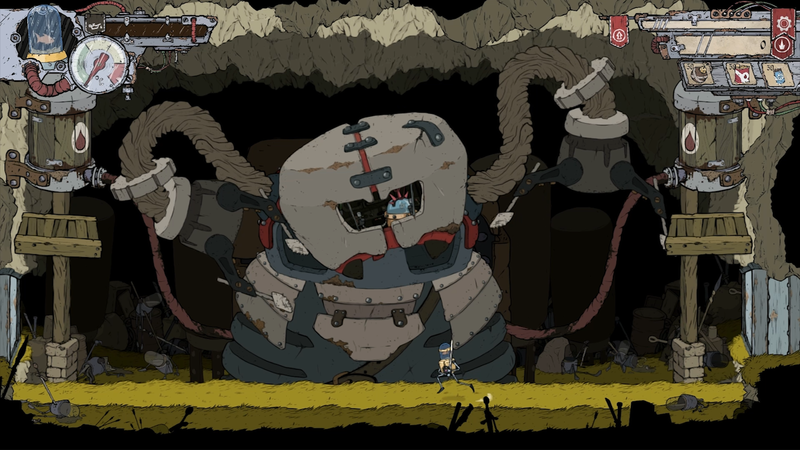 Have you ever dreamed of being a fish in a fish-tank, controlling a robot whilst embarking on a metroidvania style quest to recover the stolen oil to take care of the elderly robots? Well buckle up because that is exactly what Feudal Allow is! 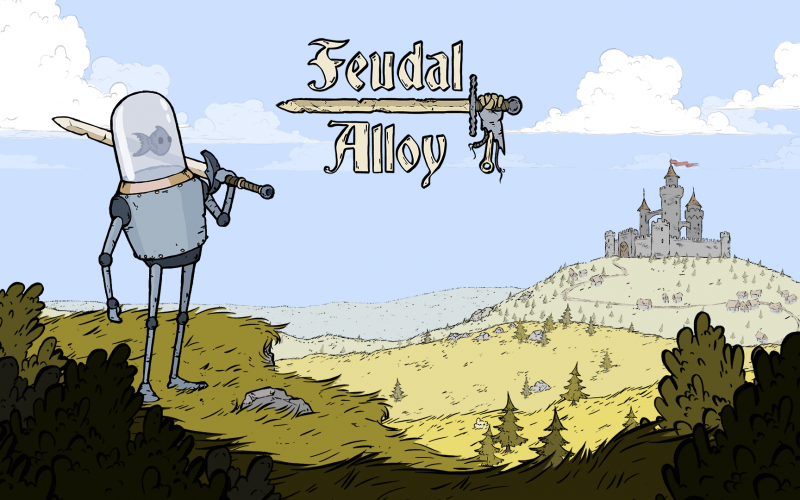 Feudal Alloy is a 2D adventure and exploration game set in a medieval world. I purposely avoided saying it is a metroidvania, although it is. You will be exploring an interconnected world and gaining new abilities as you progress further. These new abilities are key for reaching new areas and even collecting secrets if you backtrack enough to reap your rewards. In regards to the flow of the game, it is textbook metroidvania progression. You go into a medium sized map while exploring every door for any leads. Eventually you reach a room with a “boss” encounter that is 95% of the times just an enclosed arena of regular enemies. Upon clearing the encounter, you will be rewarded with a new ability and you somehow will unblock a passage that leads back to the main room, where you will see where to continue on your adventure using your newest skill. Throughout your adventure you will stumble upon equipment which will alter the stats of Attu. It will also alter your appearance if you are into fashion hunting. The variety of stats allow you to customize your playstyle to one that fits you. As promising as it sounds, I’ll admit that it shares one aspect I despise that many others game share, and that is how opaque the stat upgrades truly are. It should be easy to understand that if your weapon has damage +1 that you will deal increased damage, however I found that I needed multiple damage +1 before I actually started killing enemies faster and this is something that annoys me more than it should. Having damage +1 on a base 100 attack stat is completely different from a +1 on a base 4 attack stat, and I wish games were more explicit in that regards if they truly want to give a feeling of customization. And let’s not dig into whatever is overheat gauge +1 because just like every other stat, it is worthless without context. 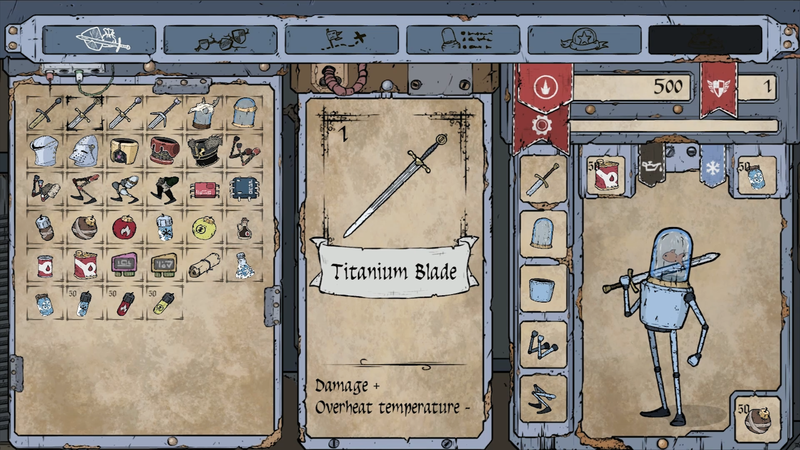 Aside from equipment, you can also improve yourself by leveling up and using the skill tree. The tree has a strength, a defense and a cooldown branch. Each subsequent level of the branch possesses stronger effects, so pick one that suits you and do so wisely. I truly mean the wisely part, in my entire playthrough I was only able to max a single branch. The actual effects of each skill are as opaque as the equipment stats, so have fun! I think it’s ok to not be able to max the entire tree from a design standpoint, as it allows players to diversify their build in a subsequent playthrough. Although I understand it, it doesn’t mean I am a fan of it. I like end game levels of strength and god forbid you decided to diversify your build, which will only result in 3 under leveled branches. What sets apart the combat from other games is the cooldown system. Most actions have an associated heat cost such as attacking, dodging or using special skills. When your heat gauge reaches its max level, you will overheat and won’t be able to act until it cools down a bit. The heat gauge is for all intents and purposes the equivalent of a stamina gauge, and it is very common to have your actions limited by the amount stamina you posses. Some special heated zones will max out your heat gauge too, so be careful when traversing these. I actually thought it was a pretty solid system at the beginning which made you think twice about your actions, but as I played more I realized the true hindrance it really was. Rather than encouraging slow and methodical combat, it quickly devolves into a heat and run playstyle where you go on the offensive and then run as your gauge cools down. Not only does it not contribute anything significant to the game, but it also discourages the use of special skill, most of which use >50% of your gauge. If you liked the enemy designs, then you will be stoked to hear that you will be encountering a lot of times throughout the game! Borrowing techniques from the era of recycling enemies with different sprite pallets, you will soon discover that every enemies repeats itself a couple of times, only sporting more armor, different colors or even a bigger size. Of course, when talking about enemies I gotta give shoutouts to the wasps and the little helicopters, who encompass two of my biggest complaints about enemy behavior. The wasp is a mindless “go to the player’s position” bot that lacks any decent attack animation and stays within your hitbox. The helicopter flies above you and retreats when you attack it, because there had to be a way to highlight the fact that your attack range is way too short. I would have been more forgiving of the lack of enemy variety if I was suprised by the boss encounters, but I’m sad to say that these are close to non-existant. Instead of the usual boss or even mini-boss battles of every other game, here you are locked in a room where hordes of those same recycled enemies show until you beat them all and claim your reward. That’s not to say there aren’t massive boss encounters, there some and they were fun. All two of them. There isn’t much to say about the music, because throughout my playthrough I was unable to distinguish music tracks. The fact is that they all carry a medieval style, which in itself is ok, but all tracks sound so alike to the point that I don’t know if there were even multiple tracks to begin with. To the best of my ability I was able to distinguish a different track when reaching the map that looked like an actual castle. While this doesn’t actually contribute to the review, I couldn’t help but noticed a lot of elements clearly inspired by Hollow Knight. 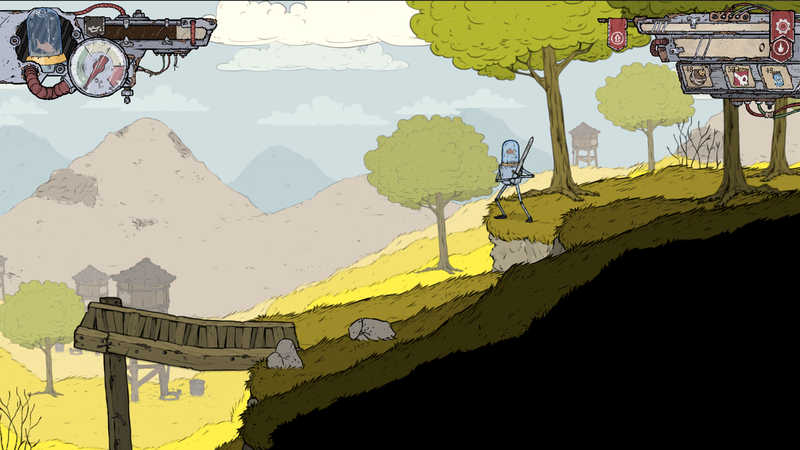 For starters, the slash attack is identical the the Knight’s nail slash in all 4 directions. Attu even springs from enemies when attacking them from above… like Hollow Knight. The other big similarity I noticed was when backtracking through shortcuts. Hollow Knight uses some very distinctive wooden supports in a triangular angle that are destroyed and reveal a shortcut. 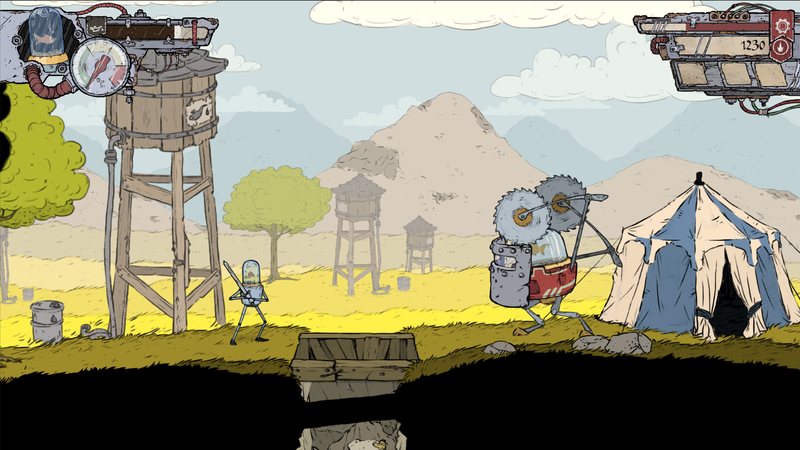 Feudal Alloy does the exact same thing. If I were to give a veredict to the game, I would say that it is the definition of an average game. The game doesn’t stand out in any regard or even evoke and strong reaction from the player. 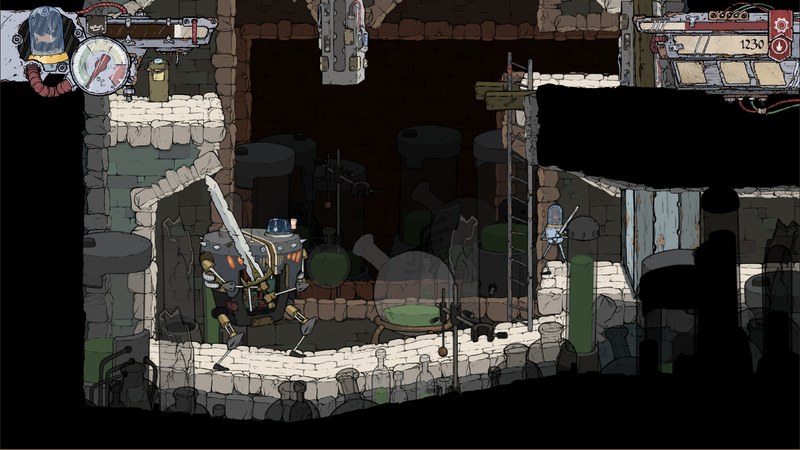 Feudal Alloy just is. It promises an epic journey but it only delivers a ride comparable to being stuck in rush hour traffic: slow and uneventful. It is a shame because the game has a neat art design and some really good animations, but when it comes to the important aspects, the game itself, it just is.